The cotton fleece has the same ballband gauge as the Oasis, but it swatched up a little larger and a little firmer. I'm leaning towards the cotton fleece, but would love some feedback. I like the cotton fleece. I haven't knit with this yarn...do you think it will have enough drape to it? I've only knitted up the Cotton Fleece as a swatch, but I agree it'll be definitely firmer than the Bamboo. There's pics of someone's LBT in Cascade Pima Tencel (mmmmm!) that your Cotton Fleece may be closer to, so check that out. There's also a couple progress pics of someone's LBT done in a varigated Bamboo. Still pretty, just different. Plus once you get to the bodice part, it'll be all in St st so you'll see the variation better. Thanks! I'm still trying to decide. 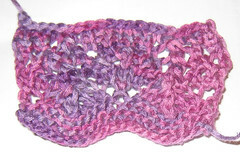 I have some GGH Bali that I am going to swatch up tonight. Hopefully I will find some middle ground. 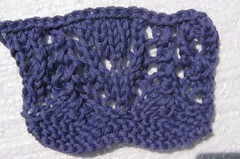 The lace pattern is much more visible in the solid color yarn. I prefer that one. In my experience Cotton Fleece can wash up really poorly -- lots of pills -- unless you are very careful (hand wash, by itself, every time)... this may not be true for all colors, but was for the purple I used. Good luck with your choices. I really like the cotton fleece. I can't wait to see your finished product.